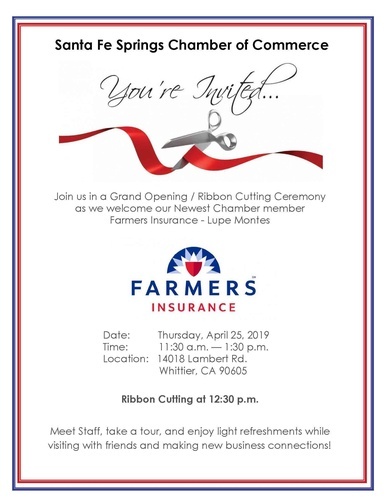 Join the Santa Fe Springs Chambers of Commerce and ​Farmers Insurance - Lupe Montes to celebrate the Grand Opening and Ribbon Cutting of her new location. Meet the staff, take a tour and enjoy light refreshments while visiting with friends and making new business connections! Ribbon Cutting at 12:30 p.m.